Scroll down and hover your mouse pointer over the Recommendations section. Click the Manage button that appears. You are now at the manage recommendations page. Remove the check mark that appears to the left of the recommendation you wish to remove, as shown. 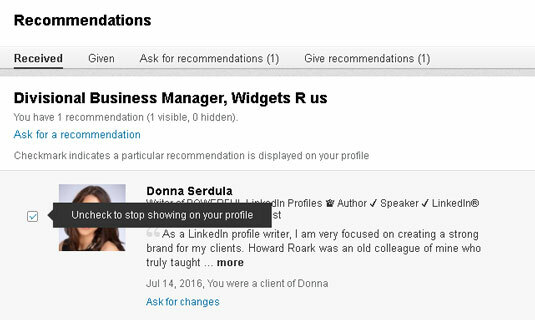 Removing a recommendation from your profile. Recommendations without check marks do not show on your profile. And don’t worry: The other person is not notified that the recommendation was removed.